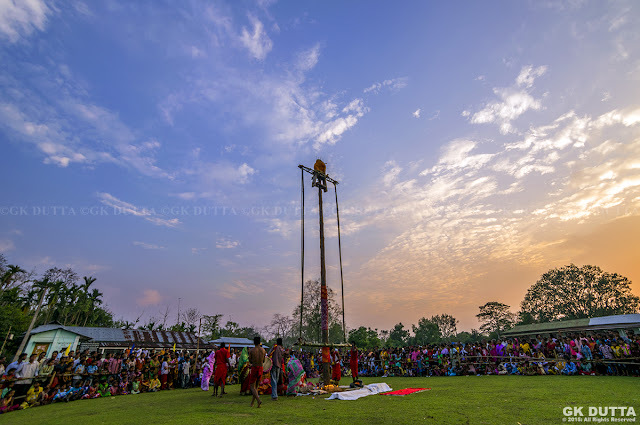 GK Dutta > PHOTOGRAPHY > CHARAK PUJA:TRADITIONAL BENGALI FESTIVAL! Charak Puja or Gajan Ushav stands unique in the scenario of Bengali festival celebrated mostly in the Indian state of Assam, Tripura and West Bengal. It is associated with such deities as Shiva, Neel and Dharmathakur. The word gajan in Bengali comes from the word garjan or roar that sannyasis (hermits) emit during the festivities. Alternatively, the word gajan is considered a combination of parts of two words – ga is from the word gram meaning village and jan is from the word janasadharan meaning folk. In this sense gajan is a festival of village folk.